If you are reading this then you already know how important your support is to us. When we started building out The Archive the ambitious hopes of creating a truly unique and challenging experience loomed over us almost sometimes overwhelmingly because we knew we needed to create something that our fans would truly love. 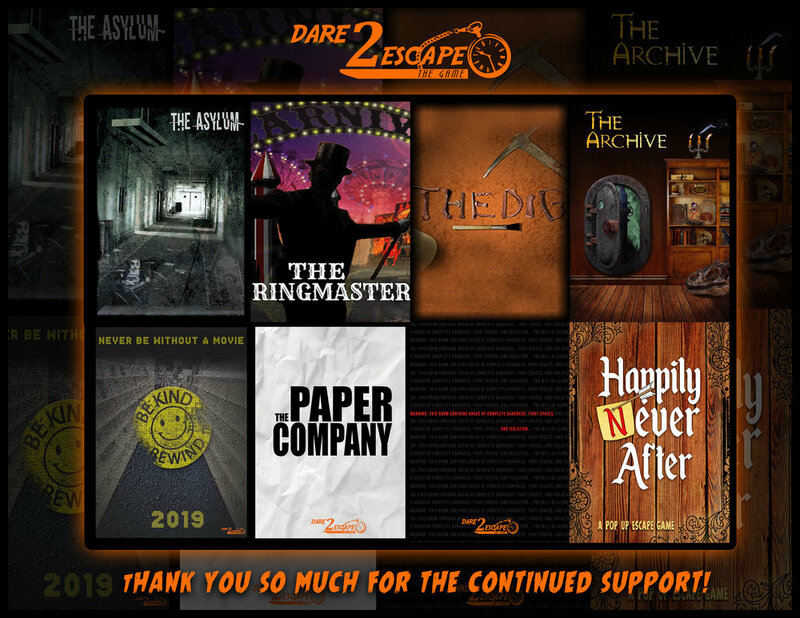 This room is a love letter to you all the escape enthusiasts, to all the fans of lore and storytelling, and for all the fans of Dare 2 Escape. It was our vision to create a full universe of characters and adventures weaved into this idea of “escaping” a room. The reception you all have shown of over the years is truly what progresses us forward with new rooms, ideas and opportunities to revisit us. We can faithfully say we didn’t expect the response we have received over our escape games and its been humbling and so heartfelt to give back to a community that has given us so much joy. We cannot wait to show you all of our plans for the rest of 2019, but in the meantime here is a sneak peek of our upcoming series called “Expansion Notes.” As always, thank you all so much for your continued support.